At the Montefiore Einstein Center for Heart and Vascular Care, our internationally recognized physicians have been treating young patients and adults with congenital and acquired heart defects for more than 50 years. From minor holes in the heart to high-risk cases requiring heart transplantation, we offer specialized surgical expertise for the entire spectrum of heart conditions and chest wall deformities for neonates through adolescents. The Center is one of only a handful of programs across the nation offering hybrid surgery (combined catheter-based procedures and surgery). Our team of pediatric and adult heart surgeons, pediatric cardiologists, nurse practitioners, pediatric anesthesiologists and pediatricians collaborates in a multidisciplinary approach to customize the most effective, least invasive treatment plan for each patient, and all under one roof at the Children's Hospital at Montefiore (CHAM). Multiple specialists evaluate every available option and procedure to minimize invasiveness. Our experts also participate in multiple research activities to help advance new treatment therapies. Realizing that we are caring for individual patients, as well as their families, we place great emphasis on family-centered care. Relatives and guardians receive exceptional education and communication about their loved one's heart condition and have access to helpful resources, such as our Child Life Program, Social Service staff and Family Learning Place in CHAM. The Department of Cardiovascular and Thoracic Surgery is renowned for being at the forefront of cutting edge therapies. World-renowned surgeon Giles Peek, MD, ranked as one of Great Britain’s “Top 100 Children’s Doctors” is Co-Director of the Pediatric Heart Center and Chief of Pediatric Cardiothoracic Surgery. He has extensive experience in newborn and complex pediatric surgery and care, with a focus on fetal cardiology and significant Extracorporeal Membrane Oxygenation (ECMO) expertise. Our patients benefit from our decades of experience, highly specialized expertise for even the most complex conditions, state-of-the-art technology (e.g. ventricular assist devices) and our collaborative multidisciplinary approach. 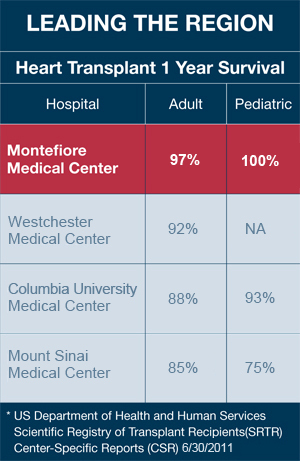 Montefiore's team treats the full range of pediatric and adult heart defects (valve disease, atrial and ventricular septal defects, hypoplastic left heart syndrome, Marfan syndrome, Tetralogy of Fallot and any opening or obstruction in the heart) and offers an extensive array of advanced procedures. Some patients can be treated with catheter-based interventions, in lieu of open heart surgery. For others, a minimally invasive procedure that only requires small incisions may be the optimal solution. Each patient's unique medical history and condition is taken into consideration by our team members in order to determine the least invasive approach so your child can return to daily activities and school as quickly as possible.